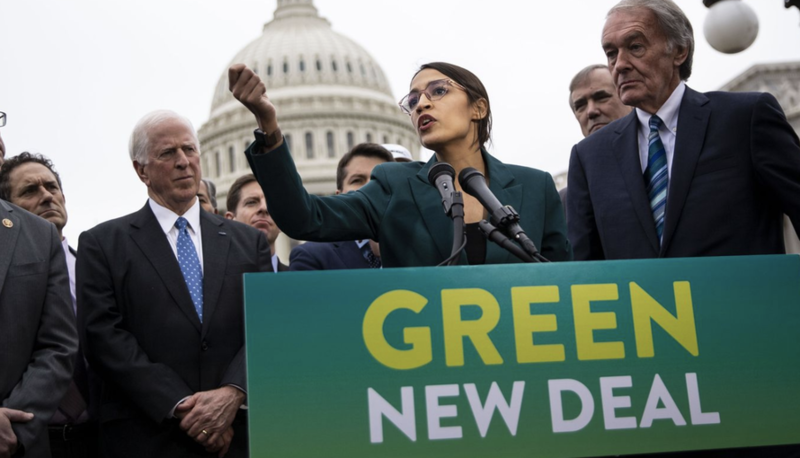 Alexandria Ocasio-Cortez's "Green New Deal" initiative was immediately met with a torrent of ridicule after its unveiling on Thursday, not just by climate change deniers but also by establishment Democrats like Nancy Pelosi, who dismissed it as a "green dream" and insisted that there were other, more practical, ways to fight climate change than banning cow farts and airplanes. But in what's looking like a staggeringly haphazard rollout, the controversy over the plan continued on Friday when co-sponsor Ed Markey, the Massachusetts Senator who was the plan's lead backer in the Senate, slammed Ocasio-Cortez and the plan's "fact sheet" for calling for a ban on nuclear power, which supplies roughly 50% of America's carbon-free energy. Not only did the nuclear power provision annoy potential supporters of the deal who see nuclear power as an essential component of any carbon-free energy infrastructure, it also revealed how difficult it might be to "build consensus" around such an extreme, radical collection of proposals. But that wasn't the only criticism of the plan lobbed by other green-energy advocates. Many, including former Obama Administration Energy Secretary Ernest Moniz, argued that the goal of shifting the US economy to 100% renewable energy within 10 years simply wasn't realistic. And pursuing such an aggressive milestone would put too much pressure on important constituencies of the left like, for example, labor unions. "It’s just impracticable," Moniz told National Public Radio. "And what concerns me about that is if we start putting out impracticable targets we may lose a lot of key constituencies that we need to bring along." Others insisted that any renewable energy plan that doesn't include nuclear power (which is a controversial subject among the green energy set) would be doomed to fail.